Remember my genius idea for the Kennywood Jack Rabbit double-dip camera? It turns out that Kennywood DOES have a camera catching terrified kiddies on the Jack Rabbit. My only question is, is the camera at the double dip?! 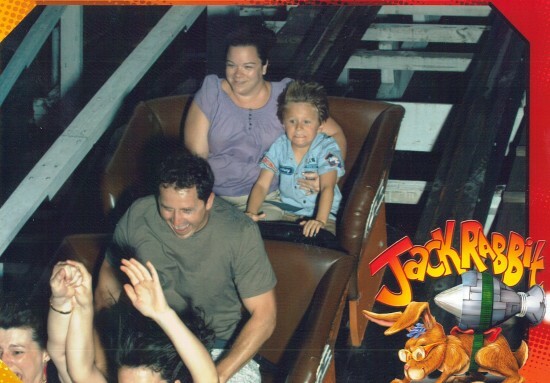 Here is reader Danielle and her four-year-old son who wanted to try the Jack Rabbit for his first ride. Oh, little did he know. DOUBLE DIP, WHIPPERSNAPPER. That’s the face of a kid thinking he’s being ejected into the stratosphere. I want to see more! Send me more, Internet! I love it! Especially mom’s superchill look on her face. It’s a rite of passage for children in Pittsburgh, and as a mom who has just moved back here, I’m really looking forward to walking my kids through it. Seriously, I still have occasionally recurring nightmares about being tossed out of a roller coaster and hanging on for dear life. I usually wake up clutching my dresser drawer. My friend and I were all poised to make cheesy faces at this camera the way we did on the Log Jammer earlier in the day. He took off his sunglasses for a better goofy face and nature laughed at him by flinging a tiny twig into his wide open eye. We had to take him to flush his eye so I didn’t even get to see the awesomeness that must have been our picture. So disappointing. See, I don’t love it. I see the face of a terrified kid and that makes me sad for him. But I don’t like roller coasters (trust me, I’ve tried to like them) and I would never take my kid on one just to terrify him. That’s not a judgement on those who do – many people find that sort of thing fun and for all I know the kids do, too – it’s just not my thing. I really do love the fact that a coaster with that kind of double dip doesn’t have seats with those blood-circulation-killing safety features and that you’re basically held in with a strap that resembles a dog leash. one of my favorite coasters of all times….. When I was a tyke in the 60’s, The Jackrabbit and the Racer and the Thunderbolt were INDEED a rite of passage, and thinking about those times (annual school picnics) makes me feel melancholy and nostalgic and homesick. I live in Florida and have enjoyed all the coasters in the theme parks in the Orlando area, but, as they say, you really can’t go back. The most magnificent coasters in the world can never compare to the three coasters that I rode when I was a little kid. hmm Does anyone remember the Big Dipper at Westview Park, or that Wild Mouse in that small amusement park on parkway west going out to the airport? Both were excellent coasters as well. I vaguely remember the Wild Mouse at … damn, can’t recall the name of the park (old age). Google doesn’t help much, as Wild Mouse apparently was a generic name for a specific type of coaster. Seems to me like there used to be little amusement parks all over the place. I remember a place called Cabana Beach on the road between Bridgeville and Canonsburg (more specifically Hendersonville), big swimming pool with a few rides, IIRC, but that was at least 40 years ago. There’s a big church or something there now. I’m dying over here, Unsatisfied…”dog leash” is both hilarious and incredibly accurate. And it felt like every year, those handles got just a little bit thicker because KW refreshed them by putting a new layer of tape over the old. I swear I could never get a grip on the thing because my hands were never big enough! So parents, what’s the protocol? Do you tell your 4 year old about the double-dip before boarding or stay quiet and watch their reaction? In the last seat too – always the best one on a roller coaster. Impressive.